Here my future learning trends. The trends are based mainly on my theoretical, i.e. keeping myself up-to-date with reading blog, reports and articles in the web and personal experience as a learner, yet my teaching experience with students is very limited, due to my infrequent access to computer labs in our school. Tony Bates e.g. publishe in his blog an interesting article “e-learning outlook for 2012: will it be a rough ride?“. He claims that tablets are 99% probable, learning analytics: 90%, Open Educational resources (OER) 70% , disruption in the LMS market 60%, integration of social media into formal education 66%, digital university 10% probability. Scanning through a couple other online sources it is noticeable that the following e-learning trends are repeatedly named. Elliot Masie, number one in Bob Little’s Top ten e-learning movers and shakers, published this Key themes for Learning 2012. 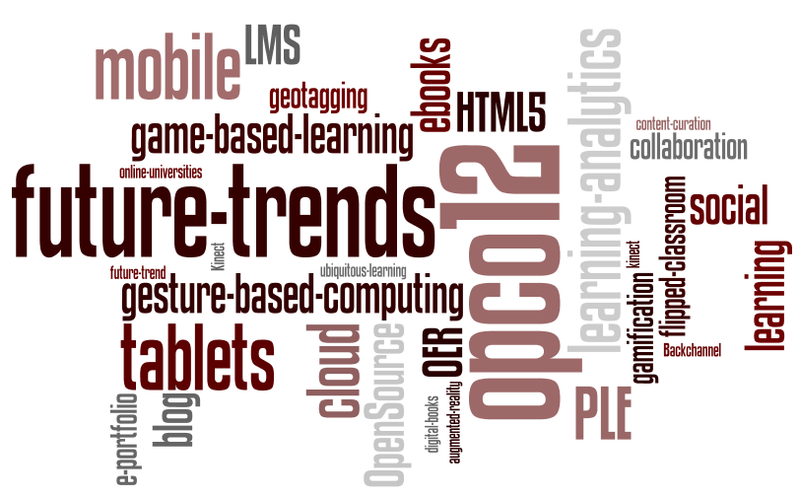 Below the trends presented in a Wordle. However, my personal wishes and hopes for the next school year 2012/13 are far less ambitious. There are two ways to get access to our computer labs in school. Either computer science is part of the lesson plan or you are fast enough to occupy a computer lab that is not blocked. Coming from an adjacent building the ‘first come, first served rule’ speaks most often against me. There is no use in planning a lesson when you don’t know whether there is a computer lab available. So much to e-learning which I believe has to be initiated and maintained in school, before students will be able to continue outside the classroom. At least with the age group of students (age 16 up to 18) I mainly teach. There experience with e-learning, is as good as none existing. Only when it comes to Facebook & Co. they are more experienced, but not for educational purpose. Well, I’ll better stop complaining now. Assuming that I could get hold of a computer lab, then I would like to make greater use of our Moodle LMS (Learning Management System). I know the trend already goes to PLE (Personal Learning Environment), but considering the inexperience and age of my students I think a supported and safe learning environment would be best to get started. I would like to foster collaboration and interaction with the LMS, next to teaching students the underlying technology. One step further would be the introduction of e-portfolios, e.g. using Mahara. E-portfolios are on the rise, partly because it became mandatory for students to document their process of work-orientation to get ‘job-ready’. e-portfolios foster many skills and focus not only on learning results but also on the learning process. Being a keen blogger myself – learning journals would be my other personal trend. Blogs can be used for several purposes, but critical reflection of the own learning would be, though difficult to achieve, a top goal. Well, my assessment is far from complete. Trends come and go and it will be our job to keep watch on these trends, to see how they develop and examine if and how these trends could be purposful applied to learning and teaching. This is very reflective, Sylvia. You have identified what a lot of teachers in the UK, especially those working in the adult and community learning sector, have to experience. On the one hand we have a government body, called Ofsted, who inspect the lifelong learning sector and would down grade a teacher for not using ICT. On the other hand we have colleges who are not prepared to put in the money towards even a computer / projector in the classroom. But some of my trainee teachers actually do use Facebook and co with their 16-19 learners, and older, for educational purpose. They set up discussions, upload homework, etc. Keep going, though, Sylvia. At least you are gathering a lot of knowledge, skills and experience through that courses you are doing! I admire you, truly, for persevering. Yes, trends will change and it is up to teachers to pick out most suitable tools for our leaners and our subject. BTW, I agree totally about Moodle being a safe, secure and easily accessible collaborative learning platform. Thanks for your kind comment Khorshed. My keen interest in e-learning keeps me going and having read about MOOCs I wanted to participate on one to find out what it’s all about and it was really very interesting, providing the chance to network with others. And as you point out trends will change, especially in e-learning, and we as educators need to evaluate them and choose the tools / methods most appropriate for our learners and of course our subject. However, following your blog you keep yourself up-to-date as well, attending e.g. training with JISC. Bye the way, whicht tools did they present? As always it is the parents and teachers who should make education relevant to students. Technology should become an inclusive tool. Where all are able to obtain access to hardware and applicationsif needed.Notebooks, iPads, and laptop computers — paid for with the help of state dollars — are becoming an increasingly popular sight in classrooms.